A tribute to classic Chicago radio station WJPC (Ebony/Jet’s radio station) hosted by Reclaimed Soul host Ayana Contreras with former WJPC program director Richard Steele, an interview with Chicago disco/soul legend Linda Clifford (“Runaway Love”, “If My Friends Could See Me Now”). We hear vintage WJPC audio including Richard Steele back in 1974 and Linda Clifford’s interview with Wali Muhammad from 1978. We also hear classic music and deep cuts from Ms. Clifford as well as her own story. Below, Linda and Richard pictured in 2018 and 1978. Reclaimed Soul’s Ayana Contreras spoke with Jazz vocalist Maggie Brown, daughter of Oscar Brown, Jr. Maggie is passionate about preserving the legacy of her father’s community-engaged artistry. As we look for solutions to quell today’s violence in our communities and to get kids off the streets, this is a notable model of artist intervention from Chicago’s past. This was recorded at a live event at Thalia Hall in Chicago’s Pilsen neighborhood. click here for more on the Opportunity Please Knock Chorus. Soul singer/Songwriter Donny Hathaway’s life and untimely death are both shrouded in mystery. Though artists like Stevie Wonder, Amy Winehouse, and Aretha Franklin have called him an influence, there is very little biographical work about him. I sat down with Emily Lordi, author of “Donny Hathaway Live”. Lordi’s recent book uses the album of the same name as a jumping off point for uncovering Hathaway’s legacy and his unique contributions to 20th century popular music. Donny Hathaway was born in Chicago and raised in St. Louis. Early in his career, he returned to Chicago. During that time period, roughly from 1968 until about 1971, Donny was very prolific. In this hour of Reclaimed Soul, Ayana Contreras explores Donny Hathaway’s early work arranging and writing for other artists in Chicago: from Albertina Walker, Syl Johnson, and Curtis Mayfield, to The Five Stairsteps and Little Milton. We’ll also hear some of his classics, compositions, and some of his very first recordings. For more on Donny’s career, check out the recently published book “Donny Hathaway Live” by Emily J. Lordi. Blind Man: Little Milton’s hooked and he can’t let her go. One of my very favorite Chess Records from the 1960s is “Blind Man” by Little Milton, released on Chess’ Checker subsidiary. Below is a rare televised performance from January of 1966 on a show called “The !!!! Beat”. “The !!!! Beat” was a program that was hosted by Nashville disc jockey Bill “Hoss” Allen. The song itself was originally released by Bobby “Blue” Bland, who does a jazzier rendition. But Little Milton’s version is all heart and glowing grit. Chess Records session men on the Little Milton version put in a characteristically stellar performance, as well. It’s beautifully brassy Chicago blues-soul of the highest order. Notably, neither version of “Blind Man” was a hit. But the song was covered later in the 1960s by British rock-jazz group Traffic. A live recording of their version was released in 1969, after the original lineup of Traffic broke up. But this is Little Milton. He’s hooked and he can’t let her go. Of this, I am wholly convinced. Jive on. Back in 1980, Chicago was still a national hub for music (like LA, Nashville, and New York are today). During that time, Producer/Promoter/Entrepreneur Eddie Thomas ran the influential Dogs of War DJ record association. Based out of Chicago, they were a record pool famous for breaking a number of seminal disco recordings. Essentially, a record pool is a service that DJs either subscribe to or otherwise sign up for. New records from participating labels are distributed to the DJs as promotional copies. Dogs of War primarily worked with DJs that worked at black clubs on the South Side of Chicago. In the day, they were frequently mentioned in disco write ups in industry papers such as Billboard. “The year was 1980 and disco was the thing. This is the pilot of the Chicagoland dance show that I shot and directed in cooperation with executive producer Eddie Thomas and “The Dogs of War DJ Association”. This show was created to feature new music and was to be shot from various discos in the Chicago area. Featuring a theme song by Al Hudson and One Way, and hosted by radio personality LaDonna Tittle (then at WJPC) and Lisa Hunter (a member of the Dogs of War), the program was an all-star affair. This pilot also features two performances featuring Chicago’s own silver lame-clad disco artist Captain Sky. His extravagant costumes are worth the price of admission. The pilot was shot in suburban Naperville (!) at Valentino’s Disco. It features, notably, a racially mixed crew of dancers. The “Dance Chicago Dance” pilot was shot in 1980, well after Steve Dahl’s infamous “Disco Demolition Night” that occurred on July 12, 1979, at Comiskey Park. The disco scene in Chicago was a well oiled machine in many ways because Chicago’s Black music scene had dwarfed the rock and pop scenes for much of the mid-20th Century in terms of record sales, record label prominence, and distribution. It was easy to get the music out there. From the Electrified Delta Blues of Chess Records to the sweet soul of Brunswick Records and Curtom Records (and many labels in between), the baton was passed to disco, and eventually to house. It’s arguable that the prominence of disco music over rock music (often considered to be “white music”) in Chicago (mixed with some good old fashioned racism & homophobia) churned up the Disco Demolition. By 1979, disco had become a universal juggernaut; but its roots were in black and brown communities, as well as in the gay community (a fact that disco shares with house music). “Tyrone Davis records, friggin’ Curtis Mayfield records and Otis Clay records,” he recalls. “Records that were clearly not disco,” but that were by black artists [from Chicago]. Regardless, this video documents clearly that Disco Demolition Night did not, in fact, demolish disco in Chicago. In many ways, disco was just about to get started as something new: House. And that usher at Comiskey Park during the Disco Demolition Night wound up co-writing what is credited as the first truly House record (as opposed to a disco record played in house music clubs), 1984’s “On and On”. He picked up a lot of good records that night, too. So Dance, Chicago, Dance. Jive on! Stretching out the Boundaries of Jazz: 10 years of the Hyde Park Jazz Festival. The South Side of Chicago has a rich history of Jazz music, and the Hyde Park Jazz Festival’s schedule represents keepers of that flame, like Maggie Brown (pictured, who is a daughter of the iconic Oscar Brown, Jr. and an electrifying vocalist in her own right); as well as younger creators such as the Thaddeus Tukes / Isaiah Collier Duo. Stretching out the boundaries of traditional Jazz programming are a restaging of Supreme Love (a live music and tap dance performance set to John Coltrane’s A Love Supreme). In collaboration with dancers from M.A.D.D. Rhythms, musicians on the set include Isaiah Spencer on drums and Junius Paul on bass. Also as part of the festival, Marvin Tate will present The Weight of Rage, which was initially presented at the Hyde Park Art Center earlier this year. The visual component is an exhibition of work developed in classes in the Prison and Neighborhood Arts Project at Stateville Prison. The show brings together work from incarcerated artists and teaching artists and writers (including Marvin Tate) in the Prison + Neighborhood Arts Project (PNAP) at Stateville Correctional Center in Joliet, IL to explore the question, “how does the state identify you?” There will be a music performance by a sextet as part of Saturday’s presentation of The Weight of Rage, as well. The Festival also announced a new partnership with the Hyde Park Art Center that commissioned visual artists to install site-specific artwork on Midway Plaisance. And, the Hyde Park Jazz Festival Story Share Project continues this year, in which visitors are invited to share stories about their relationship to Jazz (particularly Jazz on the South Side of Chicago). All stories are archived for the Hyde Park Jazz Society, and select stories will be made available via an dedicated web platform that is currently in production. For more on the Hyde Park Jazz Festival (including a full calendar), click here. This is Our (Chicago) Love Story. Darkjive, dear readers, is strictly a labor of love: simply put, if I love a song from Chicago (or am enamored by a story) I’ll share it. “This is Our Love Story” (by the Harvey Allison Experience featuring The Whole Truth) is a luscious soul record that lacks a lot of info on the label. A man and a woman serenade one another, voices intertwined like ivy. Printed on the Truth Is Records release, the year listed is 1980. No city. I suspected that it was at least from the Midwest. No smoking gun collaborators, though. No usual Chicago suspects. No Willie Henderson. No Carl Davis. Not even a Jim Porter. But one day, hopping around YouTube, I found the following early ’80s music video recorded at the CopHerbox II, which was pronounced “Copper Box” located in….wait for it… Chicago! 117th and Halsted to be exact. The club had a local variety TV show called the Chicago Party. And so, I present to you: Mr. Ken Allison and Diane Harvey (Harvey Allison Experience, get it?) with “This is Our Love Story”. Watching them perform makes me love the song more. And, dig that scene! In case you want more: local label Numero Group has apparently put out a compilation featuring the music and the visuals of The Chicago Party. 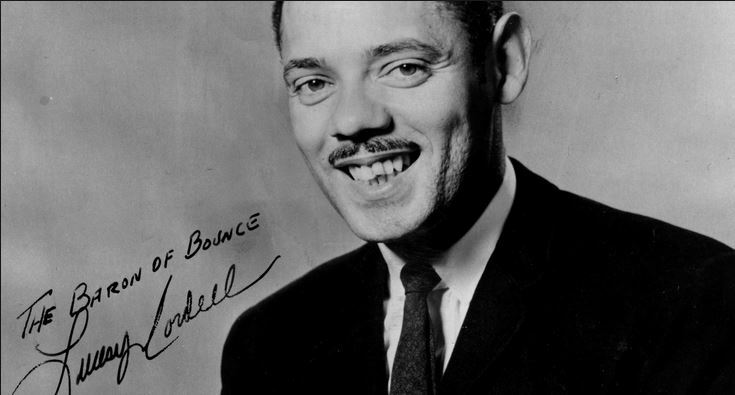 Lucky Cordell: The Baron of Bounce… and Chicago Radio Royalty. Moses Lucky Cordell was born July 28, 1928 in Mississippi. His mother died when Lucky was three, and his family moved to Chicago. Cordell graduated from Dunbar High School in 1946. He went on to a long career in Chicago Radio, initially as a disc jockey (known as the “Baron of Bounce”) and by 1970, he became General Manager at the storied WVON. He also produced records by local arti sts such as Heaven and Earth, as well as a lesser-known soul group called New Image (1977). He even released a number of spoken-word records under his own name, which all dealt with themes of love, upliftment, spirituality, and building positive character. The songs had titles like “Happiness”, “You Made a Man out of Me”, “Good Morning Lord”, “A Great Day”, and “This is the Woman I Love” (1969). “This is the Woman I Love” was written and produced by fellow radio disc jockey Richard Pegue. Initially released on Pegue’s Nickel label, the record was picked up for national distribution by Cotillion Records. 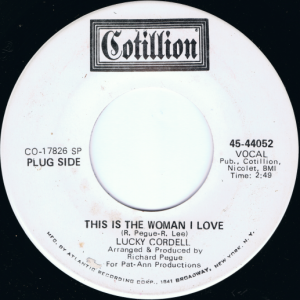 Lucky Cordell’s two daughters were also recording artists, releasing two very good records under the name “Pat & Pam” in the early 1970s (click here for more on that). Cordell was socially engaged and politically minded. He left full-time radio in the 1980s to pursue work with the Chicago Urban League and Operation PUSH. Cordell died tragically on July 7th of this year at the age of 86 from injuries sustained in a fire at his South Shore home. According to sources close to the family, he put himself in harm’s way attempting to save his daughter, Pat, who became trapped. The fire began in her bedroom, according to her sister Pamela. The fire was reportedly started by smoking materials. 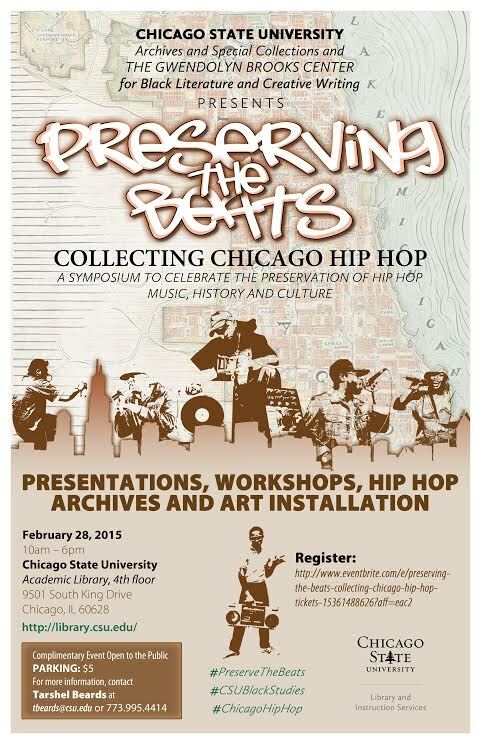 Preserving the Beats at Chicago State University. Collecting is one part of preservation of hip hop. For the history and culture to survive we need wordsmiths who write and publish about Hip Hop in order to document the past and future of the genre. This panel will discuss the importance of publishing for a variety of outlets—scholarly/ academia, blogs, journalism, niche and new media. Additionally, panelists will discuss the current climate of the publishing industry, self-publishing/ promotion via the internet, and the need to preserve the digital content. Of course, artful, true-to-life preservation of stories behind music is near and dear to my heart, so I’m glad to be a part of this discussion. More info below….